A city abundant with romantic French Quarter courtyards, elegant southern mansions and unique hotels, New Orleans is the ideal setting for a wedding. These 10 places are sure to host the wedding reception of your dreams. Once home to the warehouse for the famous American Can Company, The Cannery is now known as a top New Orleans wedding spot. The 12,000 square foot venue has an outdoor terrace, grand foyer, ballroom and a chic lounge for the big day, providing brides and grooms with options from a small ceremony to a large ballroom reception for up to 400 people. The modern venue also has a high-tech ballroom featuring LED lighting and built-in video and sound, which makes it a great place to dance the night away with all of your family and friends. The Cannery also has a private bridal suite, complete with a restroom and a private walk-in closet, so you and your bridesmaids will feel like royalty while getting ready for your big day. Oak trees dot the outside of the property giving a sense of solitude and privacy from the hustle and bustle of downtown, which is only a cab ride away. The venue offers outdoor ceremonies in a French Quarter-styled courtyard with a fountain, or you can celebrate with your guests in the grand parlors with a cozy interior and stunning antique furniture. You can use the Estelle Suite as the bridal suite during the celebration or for a honeymoon suite. Along with being an elegant wedding venue, the Degas House is also a bed and breakfast that offers a New Orleans style breakfast with mimosas every morning (the first glass is free). With nine rooms, it is a great spot for couples with out-of-town family members and friends. With its scenic landscapes of the golf course and its location just 15 minutes away from the French Quarter, you could call English Turn Golf and Country Club a hidden gem of New Orleans. The location features a garden room with a glass ceiling as well as the white house lawn and patio, two locations that are popular for sunset ceremonies. There also is a ballroom with crystal chandeliers, and a main dining room, both ideal for receptions and rehearsal dinners. The dining room overlooks the 18th hole, which is the perfect backdrop for photos, especially if you and your groom are golf fans. The all-inclusive wedding packages and an extensive catering menu are sure to make the wedding planning a breeze. “With 25 years of being in the business, we’ve done probably thousands of events,” says Racheal Apken, the sales and marketing director for the golf club. “We have tons of experience when it come to helping the brides plan their weddings.” English Turn is also one of the only country clubs around that allows non-members of the club to use its space. For the music-loving couple, the Hard Rock Café is a non-traditional location for a celebration that rocks. It is conveniently located on Bourbon Street where guests can keep the party going all night long. The location hosts both the ceremony and reception, and it’s able to accommodate small parties or huge groups of up to 500 guests. The location is a living museum, as the walls are covered with music memorabilia. To make you and your guests feel like rock stars, the Hard Rock Café will set up a red carpet entrance complete with a step-and-repeat sign. The music videos from every decade and the audio and visual connections help to complement the big day. As the name explains, the new renovated boutique hotel has a modern, eclectic feel, and sits at Lee Circle in the Warehouse District. “It mirrors the city’s juxtaposition of Old World charm with New World diversity and goes beyond just the basics,” says Grace Duplantier, the hotel’s sales manager. The Hotel Modern is great for couples that want a little something outside the box. “We are the perfect combination of classic and modern with an art-centered vibe,” Duplantier says. It is also a great location for intimate gatherings. The restaurant Tivoli and Lee caters the events, with a modern take on Southern cuisine and it supports local farms with the fresh ingredients. Tivoli and Lee’s private dining room has eclectic décor, a chic style and can fit up to 50 guests. The Hotel Modern is also home to Bellocq, a chic spot for a reception or bachelorette party. The bar was inspired by photographer E.J. Bellocq’s mesmerizing images of a pre-prohibition sexual revolution. In 2013, Esquire magazine included Bellocq on its annual list of the best bars in the nation. The Hyatt French Quarter is a great central place for the couple that wants to show out-of-town guests all that New Orleans has to offer. “Our private entrance on Canal makes it great for the bride and groom who want to go with a New Orleans wedding tradition and lead a second line into the reception,” says Vera Faucheux, the hotel’s director of marketing. Ceremonies and receptions can be held in one of two areas: the hotel’s beautiful atrium with dark wood accents or the largest garden courtyard in the French Quarter. Should you choose the courtyard as your first choice, there’s no need to worry about bad weather because the atrium allows for a quick transition if the need arises. Located on busy Poydras Street and within walking distance from the riverfront, the Loews Hotel is a fun and convenient spot for locals and out-of-towners alike. With nearly 300 rooms and 12 suites, the hotel can easily accommodate all of the family and friends attending the wedding. The hotel’s bridal package includes lots of perks, such as a special rate for out-of-town guests, a complimentary suite and a spa treatment. Another perk is a one-year anniversary gift card that the hotel throws in for the newlyweds. Whether your wedding is big or small, the Loews Hotel can accommodate it thanks to its various event spaces. The ballroom has 16-foot ceilings with wall-to-wall windows and views of the New Orleans skyline. 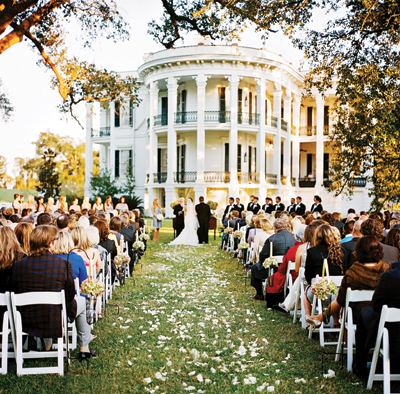 If you are looking for a fairytale wedding setting, the Nottoway Plantation is an ideal location. It is the largest remaining antebellum mansion in the South, and is located between Baton Rouge and New Orleans. The Southern plantation style provides plenty of stunning choices for ceremony and reception locations. Brides can choose to have an outdoor ceremony on the front lawn, under the live oaks next to the mansion, or in the Fountain Garden Courtyard, all with the elegant mansion as the backdrop. For indoor ceremonies or receptions, brides can choose from the breathtaking White Ballroom, or the covered open-air Grand Pavilion. The Nottoway Plantation offers many services to assist in the preparation of your dream wedding. There’s a full service salon on site that attracts brides, in addition to a dressing salon.Along with luxurious accommodations for family and friends, the mansion’s restaurant offers both casual and fine dining. With varied wedding packages, your fairytale wedding can be as intimate or extravagant as you choose. The combination of a great space with amazing food and scenery, the Nottoway Plantation is a one-stop-shop for a “Southern belle” wedding. With the Grand Salon ballroom that can accommodate up to 400 guests, the Omni Royal is one of the largest venues in the city. There are two other room options, the Royal Garden Terrace and the Esplanade Complex. The terrace is the perfect indoor and outdoor space that has great views of the city. The Esplanade Complex has a beautiful skylight and can accommodate up to 200 guests. There’s also a special prep room for the bride and bridesmaids to get ready in. The prep room has balcony access, tables, chairs, mirrors and a steamer. “The bride only has to provide the hair and makeup vendor,” Myers says. With a four-poster bed, a Jacuzzi tub, champagne and strawberries, the bridal suite is perfect for a romantic night for the bride and groom. If you want to show your guests that New Orleans knows how to party, then Pat O’Brien’s is a good bet. Almost every New Orleans local knows about Pat O’s Courtyard Restaurant with its dueling piano bar and courtyard. The Briar’s Suite is located right above the restaurant, and it has its own private Bourbon Street balcony and a copper-top piano. For larger groups, brides can also rent out the downstairs courtyard which includes the famous flaming fountain. Pat O’Brien’s also owns Pat O’s on the River, with the Grand Terrace located on the third floor of Jax Brewery, which overlooks the Mississippi River. With textured walls, antique chandeliers and a large terrace with beautiful views, Pat O’s on the River exudes with elegance and a vintage New Orleans feel. The Promenade is a newly added extension to the location, which adds a garden atmosphere and extra space for more guests to relax and enjoy the sights of the river and city. Another draw to this location is the large parking lot located next door, which is hard to come across in the French Quarter. Even if you’ve fallen in love with a place for a ceremony or reception, there are a lot of logistics to consider. To learn the right questions to ask yourself before you book, we checked in with Jill Mercer, owner of Cedar Grove Tchoupitoulas Plantation, and Valerie Gernhauser, owner and wedding planner at Sapphire Events. Is the date available? “It may seem obvious, but a bride needs to make sure that the date is not on hold or in any other way promised to someone else,” Gernhauser says. Is the tax and gratuity included? How about hidden fees? Some locations charge a cake-cutting fee or a set-up fee. Mercer says it’s important to make sure you understand the true total because those small fees can add up. Does the venue book multiple events in a day? Gernhauser says some venues, such as hotels, are equipped to handle multiple events in a day at the same time. Ask if other events are going to affect your vendors’ set-up time. What is the deal with the bar? If your wedding location comes with a bar, ask what is included in it. A premium bar, which most guests want, usually costs more money, Mercer says. What will the service be like? Ask the event coordinator how many servers and bartenders to expect. Ask how many servers and bartenders you’re going to have per number of guests. How am I being treated? Trust your instincts when you meet with a venue coordinator. “Whenever you walk into any place, whoever is showing you around should be giving you their 100 percent attention,” Mercer says. Be weary of people who do not return calls in a reasonable manner or places that require full payment at the time of signing.